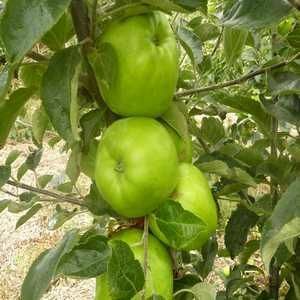 Lord Derby - Cooking Apple Tree £12.75 - Cooking Apples - Early Season Apple Trees and Fruit Trees For Sale. Buy at competitive prices with wholesale discounts. 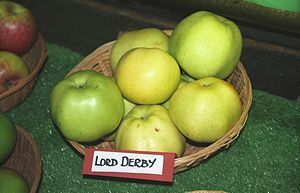 Lord Derby is another excellent Victorian cooking apple, ready before Bramley’s Seedling. It has a rich, sharp flavour when cooked, making a delightful brisk puree. The trees are very hardy, making Lord Derby an excellent choice for more exposed or colder sites - it remains a popular variety amongst Scottish growers. The trees will also grow well and produce healthy apples in damper regions of the country, so a good choice for the westcountry too! It was raised in Stockport, Cheshire in 1862.